Portable Toilet Rentals | Gallason Industrial Cleaning Services inc.
Gallason’s portable toilet rentals service is the best in the industry. We ensure our toilets are cleaned properly, with fresh supplies and a top to bottom inspection on every cleaning with delivery directly to your location. Ranging from backyard get togethers to concerts and everything in between – Gallason has you covered with our POLYJOHN portable toilet rentals. Our portable toilets come with a jumbo roll of toilet paper, Hand sanitizer and urinal pucks. Rental includes once a week cleaning with an option to add twice weekly or daily service can also be done. We offer weekend and special event rentals and also daily rentals. We provide toilet rentals and services to Fort Saskatchewan, Edmonton and surrounding area. 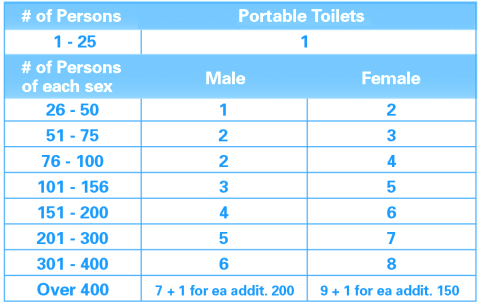 Use the handy chart to see how many portable toilet units you will need for your next event. Contact Gallason today for rentals and sales. A standard portable toilet comes with toilet paper, hand sanitizer, and an optional urinal. We suggest at least once per week cleaning for 1-10 people. A ladies portable toilet comes identical to a standard unit except the walls of the toilet are pink, this helps separate genders. Ladies will thank you! A heated portable toilet is ideal for winter jobs with access to a 110V connection. All other components are equal to a standard unit. A handicap accessible unit comes stock with a larger interior to accomodate a wheelchair, handicap sign on the door and a lower seat height. If you are looking to raise the toilet off of the ground you may ask to have a toilet with a Crane Basket. These must be returned to the ground to be serviced. The POLYJOHN Bravo portable sink is highly recommended for sites without access to running water. Gallason will deliver and service on-site. Quality, fast and affordable temporary fences are available upon request for commercial, industrial or residential solutions.